To recap, LIFEmee allows you to store, manage and share all significant aspects and events of your life: Your daily health condition, relationships, jobs, schools, possessions, hobbies, family members, pictures, notes etc. etc. The main idea is to give users a platform for organizing their lives online by collecting and structuring this kind of information for lifetime use. Users can not only review all data they fed into their "lifestream" (all data aligned along a time line) in retrospect but also lay out their plans for the future. The information can be shared or kept strictly private. LIFEmee is still loaded with too many buttons and icons, but the new site is much simpler to use than the TechCrunch50 version. The site's co-founders say after having collected feedback from early users all around the world, they tried to make it more accessible, integrate it with existing social networks and redesign the entire layout. A Japanese version was added a few weeks after TechCrunch50, too (at the event, LIFEmee launched in English only). To recap, LIFEmee allows you to store, manage and share all significant aspects and events of your life: Your daily health condition, relationships, jobs, schools, possessions, hobbies, family members, pictures, notes etc. etc. The main idea is to give users a platform for organizing their lives online by collecting and structuring this kind of information for lifetime use. Users can not only review all data they fed into their “lifestream” (all data aligned along a time line) in retrospect but also lay out their plans for the future. The information can be shared or kept strictly private. LIFEmee is still loaded with too many buttons and icons, but the new site is much simpler to use than the TechCrunch50 version. The site’s co-founders say after having collected feedback from early users all around the world, they tried to make it more accessible, integrate it with existing social networks and redesign the entire layout. 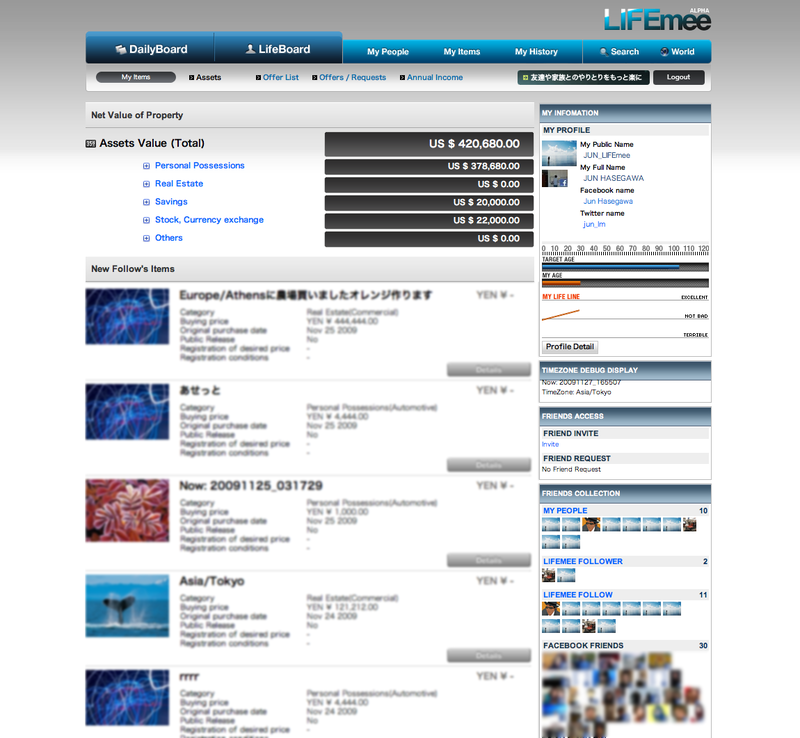 A Japanese version was added a few weeks after TechCrunch50, too (at the event, LIFEmee launched in English only). In the new version, users don’t need to register on the site anymore but can log in via Facebook Connect. Status updates on LIFEmee can now be pushed to Facebook and Twitter profiles automatically. But what’s more interesting is that it’s now possible to scrape Facebook status updates and tweets and post them on LIFEmee where they will be (theoretically) stored forever and in one place. Layout-wise, a few key elements were dropped from the splash page. You won’t find the “Last Will” button anymore, for example (early LIFEmee users deemed the option to upload a Last Will and Testament as “too dark”). The central “MyLife” area was replaced with two distinct functions, DailyBoard and LifeBoard. Whereas DailyBoard operates similarly to Twitter (asking “How are you feeling now?”), the LifeBoard is the place to go for writing a diary, keeping track of your health condition or making future plans. For example, you can upload a picture of the dream house you plan to buy 5 years later on the LifeBoard and lay out which steps are to be made by which points in time to achieve that goal. 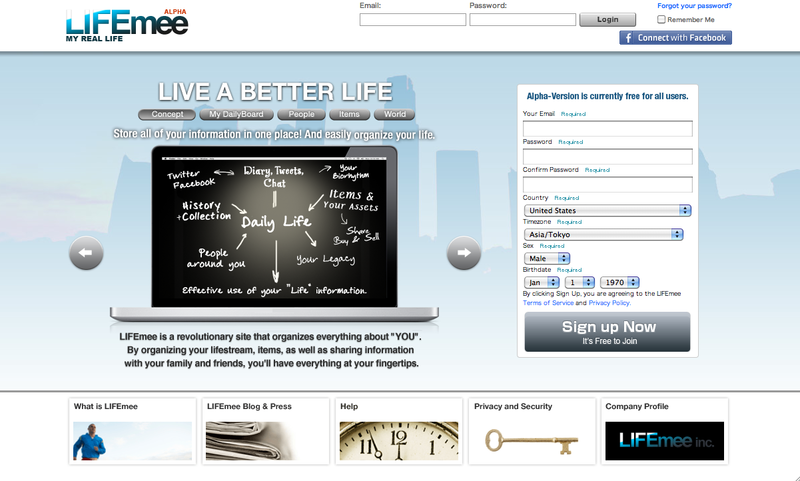 And LIFEmee added a number of other bells and whistles (i.e. a new search function that lets you search up comment and status update from LIFEmee, Twitter and Facebook at the same time, easier uploading of pictures and items, additional options to invite friends etc.) that make the service a bit more worthwhile. But the question is if we are already at the the stage where we are willing (and dedicated enough) to store our entire lives on the web. LIFEmee is still in alpha, which means there are still a few kinks that need to be ironed out, but the site is ready for you to take at least a test run. 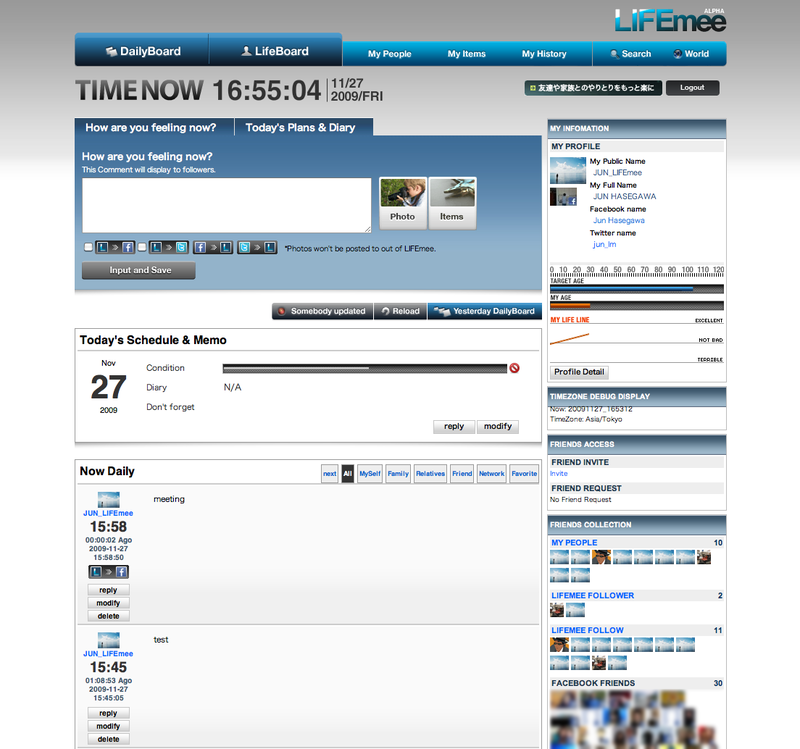 LIFEmee competes with similar offerings like dandelife, thisMoment and Rseven on the mobile.